One strand of massive connectionism is currently called social media. The goal is to connect everybody to everybody else in as many different arrangements as possible. Twitter, Flickr, Facebook, Digg, Delicious, Yahoo Answers – the whole 10,000 strong universe of Web 2.0 sites employ various webs of humans to accomplish new things. In this regime, humans are the nodes. They generate the signals. The other strand of massive connectionism relies on a massive number of machines, CPUs and computer transistors linked together in as many ways as possible to get things done. For example, gigantic server farms, data centers, and telecommunication networks. At the extreme level we’d have to include the mega-network of the One Machine consisting of all cell phones, PDAs, PCs, routers, wi-fi spots, satellite links, and so on. On this side, the signals at each node are generated by machines. Of course on the side of “people connectionism” the information is still transmitted by machines (unlike the traditional social connectionism at a large conference, ancient town, or say, Burning Man). But there is a blank white space between these two realms, where both humans and machines could be tightly and massively interlinked – but are not yet. This new territory can best be illustrated by the far-right top extreme where both sides meet in the center (red arrow) – the area where we have maximum machine connection and maximum human connection. This overlap or convergence space would be the emerging global superorganism. The entity represented by this space is not just the One Machine composed of all other machines connected together. Nor is it the Noosphere of all human minds connected into one large supermind. Rather it is the vigorous hybrid of both all human minds and all artificial minds linked together. It is the pan-mind. At this juncture the nodes are anything that generates a signal – either humans or machines. We have a small sense of this mix in Google, which relies on both massive machine connectionism and massive human work in clicking on links. But we can easily imagine other arrangements where more of all the planet’s technology is linked up and more human behavior and thinking as well. This cyborgian white space is also where most semantic web efforts are aimed. The idea of the semantic web is to make human connectionism readable by the machine side (and vice versa) so that both webs can work in concert. Semantic web technologies are a bridge or translation channel between the two sides of connectionism. All human thoughts, actions, and memories want to be deciphered, structured by machines, and machine structures understandable by humans. The big white space and red arrow is what I think of as Web 3.0 and onward. It will take many decades to explore. And of course there is plenty of room for all kinds of innovations on either side as well. From this perspective, we’ve just begun. Nice analogy of two strands synergy – a stronger rope that can take you higher on the wall. Or maybe you meant DNA, which also works! Along the lines of connecting the dots, the semantic technology community offers another potential Y axis of connections among knowledge sources. It is consistent with, and even accelerated by, the many machines connectionism. The Semantic Web is one path to enabling Y axis connections, as Kingsley Idehen comments above. Public APIs and the mashup ecology is another path to “semantic connectionism”. Semantic connectionism lets you do a “gigantic join” across sources to do inferences of a new power. Collective knowledge systems, which synthesize the knowledge source connections with social web connections, allow a gigantic join of people and their collective contributions with multiple sources of knowledge across the web. For example, joining person place and time across multiple sources can lead to new discoveries of what can be done, when, where, and with whom. This has exciting applications from travel (harvest the collective knowledge of interesting adventures around the world) to history of science (discover paths of influence across researchers and projects). I’d also agree, this stuff is coming sooner than one might think. And more generally to your own interests in the question of an evolving “mind” of the Technium and a new economics. Interesting stuff… it might be worth elaborating on how the machine-facilitated human connections are different from the old-fashioned kind of human connections (i.e. via actual face-to-face contact, telephones, print media, and mass media such as television). Obviously the greater connectivity is one thing. It’s always struck me, though, that the blogosphere for instance is to human processing power what, say, SETI@Home is to machine intelligence – it allows a lot of mental processing power that would have otherwise essentially gone to waste to be put to productive use. I was reading and saying “wait, isn’t he talking about semantic web?” just when you wrote “The big white space and red arrow is what I think of as Web 3.0 and onward”, :). Great article, I’ll add you to my RSS “must read” feeds! Mcluhan saw these things as extensions, but the lines have blurred. Technology is not our invention, it came through us, like it would any conscious being. However, it was formed from the chaos by our monkey minds and reflects our desire for diversity, understanding, and connection. Because it needs us we are extensions of it and it of us. The symbiotic relationship will lead in essence to a new form of reproduction and evolution. Perhaps we are experiencing the birthing pains of a new being that nature gave us the blueprints for and we must realize on our own. Very nice piece. I’ve been thinking along these lines recently. I made a video a week or so ago (http://tinyurl.com/cn67pf) asking a question about the current Zeitgeist. From science (consilience) to business (transcending silos) to politics to economics to everyday life, the trends are towards discovering the deep interconnections (what you’ve called connectionism, Kevin) among things (and using those interconnections to create innovation) rather than simply focusing on their differences. Maybe we can chat about this at TED next week. The white space is the realm covered by the “Linked Data” meme. I say this becuase “Meshing” the realms of the “Machine” and “Human” requires exploitaiton of HTTP’s inherent ability to negotiate the representation of “Things” (data objects or entities or resources) that are referents of URIs (data object or entity IDs). If “Machines” or “Humans” are collectively able to decipher the data exposed at: < http://dbpedia.org/resource/Semantic_Web> via content negotiation, we end up with the “cyborgian white space” you depict in the illustration above. 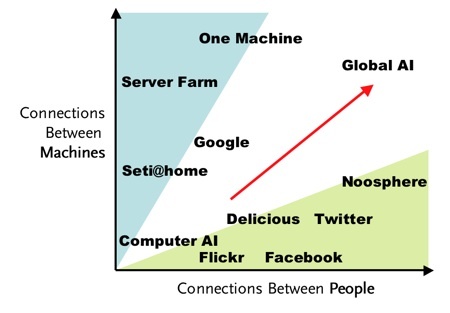 What an interesting categorization scheme that you have come up with for understanding how people and machines leverage each other. Thanks for publishing your ideas here. While I agree with the idea of charting the two strands (dimensions) of people and machines side by side, I would add a third dimension of Content. As the traditional data has evolved into structured information with the evolution of software, we have continued to develop tools to manipulate text, voice, images, video, simulate virtual reality and even assign meaning to the content we create. Can our thoughts be the next frontier? In the three-dimensional ecosystem the connected people (A Small and Clustered World) will use the hardware network (One Machine) to create, store, manipulate and access the content relevant to them. Good to see the ongoing deconstruction of the One Machine theme. Separating human networks, machine networks, and the gap in between is an interesting way to address the continuity problem. My only issue with this post is (ironically) semantic: I think the word connectionism is already taken. It is used by cognitive psychologists to describe a very specific and scientific method of neural analysis. You would be hard-pressed to find researchers willing to apply the label to social networks or machine networks, because to them it is something very formal. Actual connectionists are almost exclusively interested in the workings of the real physical brain, not the metaphorical one. That’s why I prefer the term connectivism. First of all, it isn’t taken by scientists. Where it is used (on my site and elsewhere), it refers very explicitly to an idea, a metaphor, rather than to a scientific method. By having a term that is reserved for discussing the metaphor, the definition can be tweaked to better understand that metaphor, without treading on existing science aimed at understanding the physical brain. connectionism explores how brains are like networks, but connectivism explores how networks are like brains. That’s a big difference. Maybe I’m just splitting hairs, but I think it’s an important distinction. Perhaps one day the two terms will collide, but until then, we’d saving ourselves and neural scientists a lot of confusion. I read your posting on the “two strands of connectionism” with great interest. Do you of any existing projects (experiments) that fall along on the red arrow of your figure?